I have a strange problem that just appeared the last couple of days. In a spreadsheet that I had hyperlinks created they no longer work, and I have no idea why. I can create a new hyperlink in a new work book and that will work fine. But if I paste the data from this old spreadsheet into a new work book to create new hyperlinks they won't work. Or I had one hyperlink that would only work if I pressed enter on it and then arrowed down and back up to it and pressed enter again and then Excel would jump to the correct cell. Anybody have any experience with anything like this with hyperlinks in Excel 2010 and Windows 7. Moving a hyperlink that is pointing to a cell in another sheet in the same workbook will not work in another Excel work book if the sheet names are different. As a test, right click on a cell with a hyperlink and click on Edit Hyperlink and see what it says under "Edit cell reference" and this may give you a clue as to what it is trying to link to and why it won't work, or post a screen shot of the pop-up so that we can diagnose the problem. I did the verification of the hyperlink and everything was OK. Even in the original work book the hyperlinks all worked fine for months but now they don't. And nothing changed I didn't rename the file or anything so I can't see why they now don't do anything. And if there was a error message that would pop up I would tell you but nothing happens. How are you pasting? Normally ? or using Paste Special???? The pasting would seem to be a secondary problem. The real problem seems to be that the links in that one workbook have been corrupted and when zidnod tries to copy them to a new workbook the corruption is transferred as well. When he recreates the link it works fine. You could also try a "repair" but again I doubt this will help since the problem is constrained to the one workbook only - but repair is worth a try since it won't do any damage. It may be that the only solution is to recreate the whole workbook with as little copy and paste as possible so that the corruption isn't carried over. You know in the beginning I never put sheet1 in my hyperlink string I didn't do this until I tried to hyperlink from sheet1 to sheet2. The new hyperlinks in the new work book all have the sheet1 line in them. But when I press enter on them they only work maybe ever fourth time. And I feel a little slow right now I finally saw the tip to do a repair. Can you give me some kind of idea what this repair is . At this point I would be willing to try anything. is PROFILE.xlsx a different workbook than the one where you have the hyperlink? how are you creating the hyperlink? are you entering the =hyperlink... statement in the cell? No, that hyperlink formula is on that new spreadsheet that I'm recreating the original without copying and pasting. And I am hand typing these hyperlinks just as you stated. So what are you trying to link to and from where ? Is it from one excel file to another excel file on the same computer in the same directory? I don't understand if you are typing in the hyperlink location why you would be surprised to see SHEET1 as part of the statement. This hyperlink is a same work book hyperlink. Meaning I press enter on a hyperlink in Profile.xlsx in cell A1 and Excel jumps me to K1 in the same work book and on the same spreadsheet. My original hyperlinks I created from the beginning never had a reference to what sheet the hyperlink was associated with. I just came across this when I tried to create a hyperlink from sheet1 to Sheet2. I should point out that in the old work book when I created a link to sheet2 all the other links that had no reference to sheet1 stopped working. This might have been the cause of the corruption. All my hyperlinks are sheet1 in the same work book and I still have a real problem with them. They don't work the very first time I press enter on them. 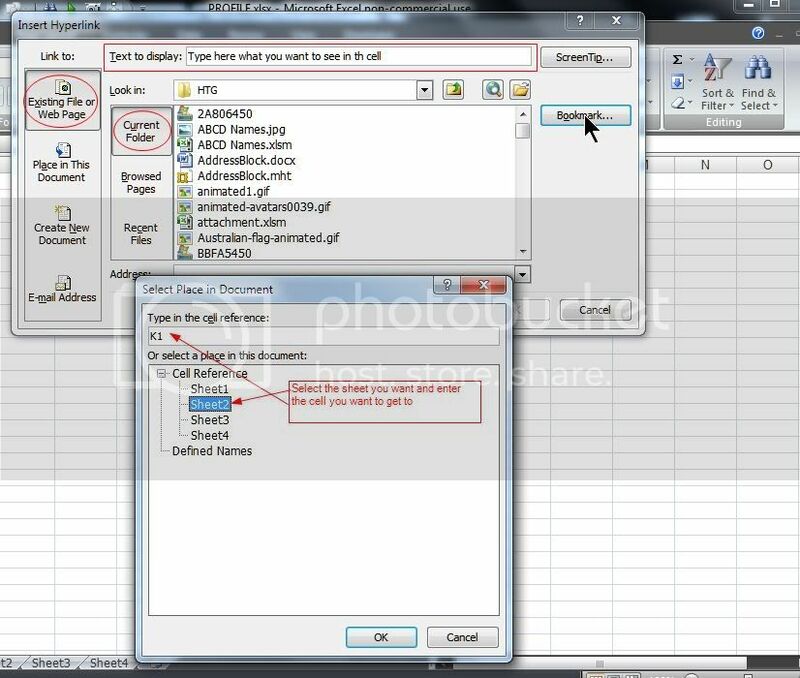 The second K1 refers to K1 in Sheet1 and the contents of that cell would appear in the cell with the hyperlink. 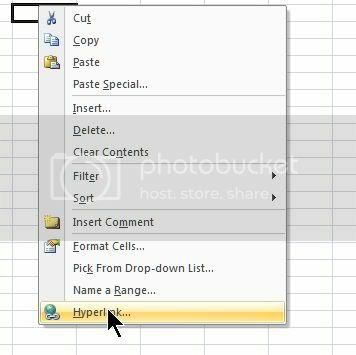 Can you give me a little tutorial on how to use the right click hyperlink menu option. I can never figure out what I'm suppose to type into the path name. If I type the same string as we have been talking about Excel gives me a warning that the file can not be opened. As a rule, you should not be typing anything - there are too many odd characters that Excel needs to make it practical. - If you want the linking cell in the original workbook to say something descriptive e.g. "Click here to open xxxx.xls" then type that onto the "Text to Display" field at the top. Thanks for all the help. I got it all to work thanks to your excellent instructions. And now all my hyperlinks work great every time.